Saturday 2 December 8pm. £15 or £30 including dinner. Phone 01308 459511 to book. If you like jazz that swings, with recognisable tunes, melodic solos and exciting improvisation — the thrill of the jam session and the jousting between soloists — then the Jazz Courier Pigeons is for you. Add to that the witty introductions and repartee of this extraordinarily clever and accomplished band and you have an evening you really shouldn’t miss. In a typical set they pay tribute to the melodies sung on screen by Frank Sinatra or Peggy Lee, the great trumpet solos of Louis Armstrong or Clifford Brown, and the rhapsodic saxophone repertoire of Coleman Hawkins and Ben Webster. There are the compositions of Irving Berlin, Jimmy Van Heusen, Jimmy McHugh and Dorothy Fields, and Duke Ellington. The band features the mellow trumpet of Ian Smith, the vibrant tenor saxophone of the Swiss-born virtuoso Luca Stoll, and the energetic double bass of BBC Radio 3’s Alyn Shipton. Expect to hear well-known songs like “Sunny Side of the Street” mingled with jazz classics like Duke Ellington’s “Perdido” and the split-second timing of intricate jazz riffs such as “Hollywood Stampede”. And there’ll be romantic ballads as well, from nightingales singing in Berkeley Square to foggy days in London town. Swiss-born LUCA STOLL started playing the cello when he was 9 years old. After hearing Paul Tortelier live, he decided to become a professional musician. At 15, he switched to tenor saxophone and jazz. In 2005 he moved to New York City. Where at the Village Vanguard he sat in with Branford Marsalis, with whom he then studied privately for several years. He also took private lessons with Dennis Irwin. In 2007 he earned a BFA from the New School and in 2013 a MA from CCNY. He performed at Smalls, Fat Cat, Kitano, Little Branch, and other venues. He studied jazz history with Phil Schaap, and taught as an adjunct at CCNY. The Luca Stoll Quartet toured Switzerland, France, and Japan. In 2015 he moved to Oxford, UK. In 2016 and 2017 he had the opportunity to perform with two legendary drummers: Alvin Queen and Kenny Washington as well as many other leading jazz musicians in numerous venues including Ronnie Scott’s. Hear Luca Stoll here. IAN SMITH has played trumpet with talents as varied as Gwyneth Herbert, Hank Wangford, Alan Barnes, Vimala Rowe and Michael Horowitz. He has lectured on Modern and Renaissance Poetry at universities on both sides of the Atlantic while also playing jazz regularly. 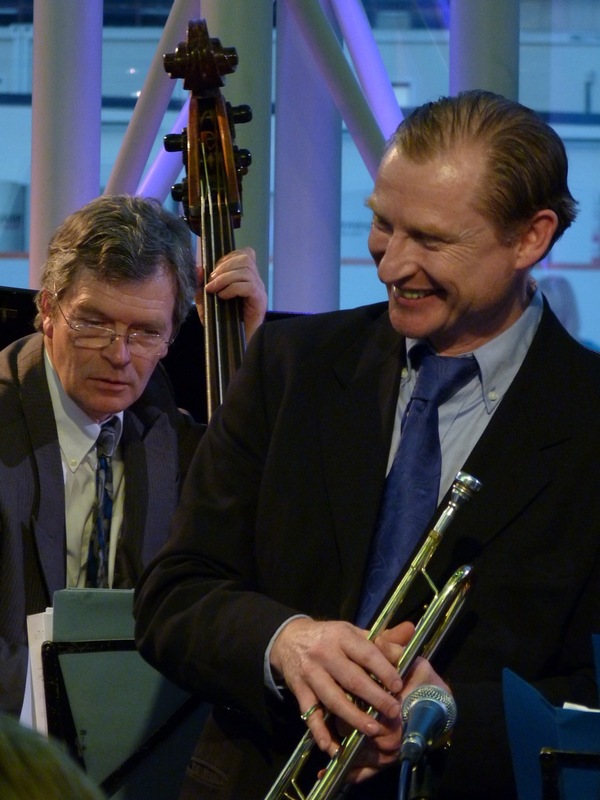 He has performed at leading jazz festivals and on BBC Radio 3 and 4. A regular star performer at Sladers Yard, his events are always red letter days. A published writer, Ian Smith and Alan Barnes wrote and performed an acclaimed BBC Radio 4 drama, Blood Count, about the final recording of Duke Ellington. ALYN SHIPTON toured in the London Ragtime Orchestra for fifteen years, and also played with Ken Colyer’s Jazzmen. An award-winning author and broadcaster, he has written on jazz for over twenty years for The Times in London, and is a presenter/producer of jazz programmes for BBC Radio including Jazz Weekly Requests on BBC R3. He was Consultant Editor of the New Grove Dictionary of Jazz, and has a lifelong interest in oral history, including editing the memoirs of Danny Barker, Doc Cheatham and George Shearing. His first biography of Fats Waller, published in 1988, has scarcely been out of print since. He has since written numerous books about jazz and is currently a lecturer on jazz history and a research fellow at the Royal Academy of Music, London. Sladers Yard’s jazz evenings bring together some of this country’s most brilliant players in intimate evenings with wonderful food cooked by our Licensed Café chefs. On Saturday evening, you can choose from a three-course dinner menu. The £15 ticket price buys a full main course from a choice of seafood, free-range meat or vegetarian/vegan dishes. A wonderful selection of starters, desserts, cheese and wines are also available. Phone 01308 459511 to book your table now!